Clothing the People Exhibition – extended by popular demand | Eastwood Patchwork Quilters Inc.
Another exhibition of interest to textile lovers is now on until November 16th at the Old Government house in Parramatta Park. 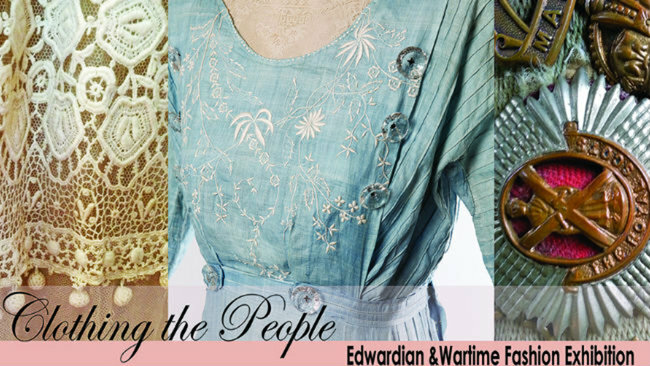 From fine lacy lawn tea gowns & elaborate beaded opulence to austere military & service garments, come and see an eclectic and beautiful display of fine Edwardian & War time Fashion, with a slice of Australian style. This exhibition takes form as a collaboration between the National Trust Costume and Textiles Collection and the private collection of Glennis Murphy &ndash; Over the Top Vintage, along with items from other collections and collectors, including Australian Military Specialist Brad Manera, Cavalcade of History and Fashion, NSW Lancers Memorial Museum, The Kings School and family mementos from Old Government House Volunteers. Some truly stunning Edwardian gowns recently unearthed from the National Trust’s Costume and Textile Collection at Old Government House will be complimented by the amazing private collection of Vintage Fashion Dealer Glennis Murphy, with her beautiful gowns and utilitarian fashion from the wartime period.